I’ve recently brought myself a Track Stick, after Ben pointed them out on thinkgeek.com. Believe it or not, the purpose of this purchase was not to attach it to the underside of a family members car, nor will I be attempting to covertly attach it to employees feet to verify that they’re are just going across the river for some lunch and not in actual fact going for an interview somewhere else. In fact, it’s far less sinister than all of that, to track my holidays, places I’ve been, and more importantly – the photos I take whilst I’m there. Geotagging, or geocoding has received quite a lot of press lately, since Flickr have introduced it into their service. View your photos on a map like Google Earth. Search for your photos based on location. Find other photos that were taken in a similar area. Automatically create descriptions of your photos based on how other people describe theirs of the same place. Use all of those photos to construct 3D models of your holiday. You’re going to need a GPX track file, like the one here. The bare minimum you need is the latitude, longitude and date/time. Sadly, my Track Stick won’t output this by default. So I had to create a small script to make one from the CSV format it does supply. If you’re in a similar position, you can download my quick hacked together perl script to create your own. I may improve on this in the future, but for now it works. Secondly, I used a small application called WMMX Location Stamper. Click on Photos -> Add Photos, and select all the photos you want to tag. Click on Tracks -> Add Tracks…, and load the file you’ve created as above (or obtained elsewhere if you’re not using a Track Stick). Click the Apply Tracks button on the bottom, and you’re done – geotagged photos. Using Picasa2, you can save your photos in a Google Earth file and share your entire journey with your friends and family. Select a location, where you want to save your file. Finally, all of these photos can tie into Gallery2 (which is what I’ll be doing) using the existing Google Maps Module, or watch this space on Tadek’s blog, for a really promising looking module to view locations on single images. WMMX Location Stamper – Stamp your photos with GPS information. Totally Free. 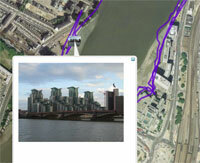 GPS Visualizer – A great online tool to sort our your GPX files, and much more. Photo Studio – John Hawkins’ explanation of geotagging with Photo Studio. Robo Geo – nice tagging tool, but it’s a pay-for software and doesn’t really do the job any better than the rest of them.